GREAT addition to the series. I was surprised that I might actually like it MORE than The Goose Girl. Is that possible? This story is about Enna, don't worry Isi is there! But this is Enna's story. It takes place in the Forest mainly. There is a war brewing and Bayern women accompany their men into war. It is so that they will remember what they are fighting for. 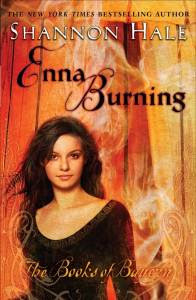 There is a powerful language that Enna learns, fire. She needs to learn to control it to save her people and herself. It is a GREAT STORY!! I also love Finn. I was so glad he was given a bigger part in this book. He is lovely, and is just what a man ought to be. Will romance bloom in the midst of war? Wait and see! Shannon Hale does fairytale's like nobody else. She is a pro! You need to read this series! Get lost in Bayern! Great review. I'm running to Goodreads again :) Your blog always does that to me. I really trust your book taste. Just linked to you from Mindful Musings. I like your site. Am glad to have been introduced and will be checking back often.